Here we are, about to ring in the New Year once again! Which means it’s time for my annual New Year’s stitching resolutions article. It’s the time of year to review my stitching goals from last year, and create my new list to move forward with in 2016. Last January I went for only three goals because 2014 was NOT my stitching year. I think I failed all but one of my goals from 2014. So I tried to go for small, manageable goals that I thought would be easy to complete in 2015. How did I do? Well, I definitely stitched more – a lot more! Which I’m happy about. I still had a very long dry spell over the summer and fall, which was when I was working full time, but even with that I was still able to stitch on a lot of projects and even finished a bunch! Which leads directly into the second goal – finish 10 or more projects. The last project I finished in 2014 was my Families Are Forever Photo Album (which I still need to do a Friday Finishes article on), so counting all my finishes from after that point, I finished… exactly 10 projects in 2015. This includes the 5 projects I stitched specifically for Christmas, so I just barely scraped by on that goal. But hey, I only finished 4 projects in all of 2014, so 10 is a big step up! As for my rotation? Totally failed! I got about two months into my rotation projects (which you can see the first video of here: Mini Kit Rotation Series) before I lost pace and never went back to them. Rotations are apparently just not my thing. I’ve had a rotation goal on every single one of my stitching resolutions lists since I started making them in 2013, and I have failed that goal every year since. I think I’ve learned my lesson – no more rotation goals for me! 10 projects a year seems about my average for finished pieces. I did 10 in 2012, 10 in 2013, 4 in 2014 (let’s pretend that year didn’t happen), and now, 10 in 2015. I can definitely step it up more than that. As both an incentive to keep up my ‘stitching more’ progress and to boost my overall number of finished pieces, I want to finish at least 15 projects in 2016. No more, no less! I mean, more would be great, but I’m not going to push my luck. This one is moving outside my comfort zone, but if I don’t go outside it, I will never learn or grow! Everyone who knows me knows I hate large projects. Anything over 5×7 is almost unmanageable for me. In 2016 that is going to change! I am going to start one of the many large projects I have in my stash. I won’t finish – so I’m not going to make that the goal – but gathering the courage and plunging into a project that would otherwise seem overwhelming to me is a great way to push my boundaries in 2016. This piece has frustrated me for too many years and I’m sick of it! I started these Stamped Owl Pillowcases for my sister several years ago… now so long I’ve forgotten the exact year. This year, I attempted to finish them for Christmas. And I completed failed, to the point where I took them off the gift list. These pillowcases drive me nuts, but I’m not going to give up and toss them, I’m going to finish these suckers so I can finally be rid of them! Wish me luck, because I’ll need it. Four stitching goals this year! One more than last year, and slightly more ambitious. Now that I know I can push through the lack of motivation and get stitching done, I want to up my game and see what I can complete in 2016. 2015 was a good year – let’s see if 2016 will be better! What are you looking to accomplish with your stitching in 2016? Halloween is two days gone, and every crafter knows what that means: you should be halfway finished with all your Christmas presents you’re making right now! Unless you’re me. Then you always wait until November 1st to start planning who will get what, and then have a small panic when you realize you are a terribly slow stitcher and will never get finished in time. This year is no different! Actually, it is a little different… I wasn’t originally going to stitch my Christmas presents this year as I have in years past. I haven’t picked up my needle in months (if the lack of articles on the blog over the last few months is any indication), and I was generally feeling down about my craftiness and whether I even wanted to make the effort this year when I knew I wouldn’t get it done. So here I am, spending today sorting through my stash and picking out projects. I even bought new charts! I’ve been on a stash diet for months now until my stitching bug came back. It feels like today was the day to splurge. I can almost guarantee I don’t have any of the colors I need for any of these new charts, because I never have the colors I need when I need them, but that means a shopping trip and more goodies for me! Some of them I’ve already started. Some I have to kit up still. But after all my planning today I feel like my stitching bug is finally back. I’m ready to pick up the needle again. I’m ready for Christmas! What are your plans for the holidays? Got projects you need to finish? I’ve Been Bit By The Project Bug! I saw a retweet from Mr. X-Stitch on my Twitter the other day for a chart on a nerdy take on a “Welcome Home” cross-stitch. It was a design by HappyStitchNet on Etsy and is a CSS style code. When I saw it, I immediately had to have it. Both my boyfriend and I are nerdy people who dabble in code – he has a degree in Computer Science, in fact – and it was one of those unique pieces I wanted to get and stitch for our home. Those who know me know I only very rarely stitch charts, so it must be a rare thing to attract me to something that’s not a kit! I just had to have this! Home Sweet Home in CSS by HappyStitchNet. Purchase this here. After I bought it, I found another chart by HappyStitchNet of an HTML mock-up of a website called HTML Welcome Sign. I just had to have that one as well! So I bought them both and printed out the charts and decided to kit them both up. Then, I stumbled across an old freebie in my Free Charts folder from Birdie Stitching. I’ve followed her blog for years and I’ve saved a lot of her Pokemon charts to eventually stitch, but I haven’t actually stitched any of them. So when I found this Luvdisc Chart in my folder I decided I might as well add it to my pile of charts that I was suddenly accumulating. I printed it off as well. Push Button, Receive Bacon image. I think this was converted into a cross-stitch chart at one point? I found a Folksy store and an Etsy store that claimed to have sold the chart at some point, but they were both no longer available. I don’t know whether it’s safe to chart the image myself, but I did! I couldn’t find who owned the image, if anyone; I think it’s just a meme based on the images on a hand dryer. It’s for personal use anyway so I’m covered if there is some sort of copyright on the image. I hand-charted a pattern based on the image, changed the spacing on the picture and the words at the bottom, and then printed that out as well. I went from having no charts to do to having 4 charts to do in about an hour. I’ve clearly been bit by the Project Bug! I’ve got a whole pile of projects to do already, I really shouldn’t have added more to the pile. I sat down and looked at all these charts I now owned. What should I do with all these? And then I realized: my boyfriend’s birthday was coming up. The Bacon chart was expressly for him, but the rest I could do for him as well. I have roughly two months before his birthday to stitch all four charts. So I could stitch them for him! It would be motivation to get them done now and not five years from now. I think this is the most projects I’ve kitted up all at the same time, but I’m happy the Project Bug is here! My projects all kitted up! Everyone has their own ‘rules’ when it comes to cross-stitch. It stems from the fact that more often than not, the community is almost wholly self-taught. When you first start out, the guides and the instructions only tell you the technique you need to learn: come up, come down, make an ‘x’. They don’t tell you how to do it, just that however you make an ‘x’ with needle and thread, that’s considered a cross-stitch. For a beginner entering the cross-stitch community, the sudden amount of ‘rules’ can overwhelm. Backs must be neat, no carrying your thread, no waste knots, stitches must be consistent, work from the center, work from the corner, backstitch last, borders first, etc. etc.. The thing is, everyone will tell you a different set of rules based on what works for them. The truth of the matter: cross-stitch HAS no rules. None. Despite what others may say about the craft, the ONLY rule of cross-stitch is that your threads must come together to make an ‘x’, because otherwise it’s not cross-stitch. That’s it. If you can make an ‘x’ on fabric, you can cross-stitch, and the personal method you use to create that ‘x’ can be whatever your heart desires. I’m here to tell beginner stitchers that these so-called ‘rules’ are more like guidelines, created from thousands of years of stitchers figuring out what works best for them. (Yes, thousands of years – cross-stitch is considered one of the oldest forms of embroidery on the planet.) 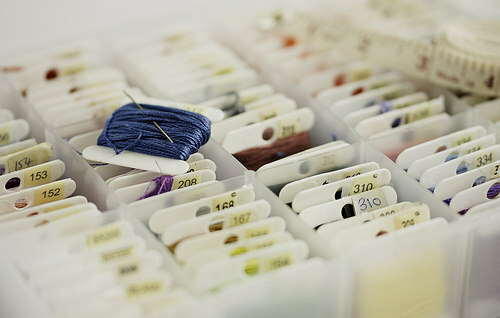 The personal guidelines for one stitcher may not work for another, who has developed their own methods and preferences when it comes to stitching. As for me, my only ‘rule’ is this: all stitches must go in the same direction. If I start my piece with the bottom stitch / and the top stitch \, then all my stitches must go /\. To me, the finished piece looks cleaner and more uniform that way. This is an extremely common ‘rule’ that stitchers will tell others because it works and looks the best for the majority of the stitching community. Still, if you don’t like to have your stitches going the same way, you don’t have to do it. So don’t be overwhelmed when it comes to the ‘rules’ of the craft. There are no rules. You can pick and choose between thousands of years of work and pick whatever techniques and methods work best for you. Each finished piece is wholly unique to the individual who stitched it, and even if two stitchers followed the exact same guidelines their finished products wouldn’t look exactly the same. That is the beauty of the craft. How Many Days Until Christmas?! Oh my gosh, it’s the middle of November already. Where in the world did all the time go? Can I have have time back, please? I’m not ready for Christmas! I mean, I am ready for Christmas. I’m from a family where we start decorating as soon as Halloween’s over. I’ve already got Christmas music on the radio. I’ve done a lot of my shopping already. (A lot – but not all. I’ve still got a lot of gifts left.) The boyfriend and I are getting our first tree for the apartment. It’s the kitten’s first Christmas. I’m excited! What I’m less excited about is that I wanted to do stitched gifts again for Christmas this year, and yet again I haven’t started on any of them. We all know how well last year’s Christmas gifts turned out. It seems like I’m always too busy to start on projects for Christmas this time of year… I’ve moved three times in the last three years and each time it’s been towards the end of the year. But I don’t want to start working on projects in January or February! I think part of the reason why I’m so behind on gifts this year, more so than even last year, is because I’m not sure how much of my family actually appreciates the stitching, and I’m nervous to give them anything. Stitching something takes a LONG time, especially if you’re slow like me. I’ve been seeing more and more stitching horror stories lately about people making pieces for their friends or family and having the gift go totally unappreciated, and in some cases, thrown away or given away in donations. With the amount of time I spend rescuing pieces from being thrown away and from thrift stores and the like, I’m terrified my stitching will end up in the same place. It’s like… I see projects all the time and I think, “that will be wonderful for so-and-so!” But do I really want to put in hours and days and weeks of work into something if the other person is going to think it’s cheap or not valuable? Look, So-And-So, I spent a MONTH working on this, for YOU, when I could’ve been doing a hundred other things!, is what I would like to say to this imaginary person. I guess the easiest solution would be to ask the intended receivers of the stitched gifts if they would like to actually receive them. My mind rebels against that. I don’t want to ask. Don’t ask me why. Maybe I’m afraid that I ask and it turns out no one wants my stitching that I put so much time and effort into. Thousands of stitches a month, hundreds of words on the blog, devoted to this one subject, and yet no one in my family will take a stitched gift. I know that isn’t true, though. I know several relatives who would love a stitched gift, and I don’t have to worry about them ending up in the trash or some thrift store donation box. So I suppose I should stop worrying about imaginary people and focus on the people I know WILL want the gifts. Make things for them. And if there’s someone I’m on the fence about, I can either ask or let them approach me about stitching something for them. I’m not so poor I can’t buy those people regular gifts, and take the time to make things for people who will appreciate them! … Of course I have this epiphany now and once again I’m reminded there’s a month and a half until Christmas. And I’m a slow stitcher now on crunch time who does not do well under high pressure, as we learned last year. So… I should probably put my grand plans to bed until next year. My Sweet Baby finish is definitely being given away for the baby’s first Christmas, and I have another project I’ve yet to start but is a very fast stitch as an insert for a photo album. There’s two. Same number as last year. I can reach this one manageable goal, right? Right. I can do this. Christmas 2014, here I come! Have a little sort of Random Corner video! I figured since I’ve got all my stitching stuff together and organized and my desk all set up, I’d show you guys what my stitching area looked like! I can’t believe this is the first video I’ve uploaded to the YouTube Channel in several months… I’ve really been slacking. So National Blog Posting Month has come around once again this year, except this year I’m prepared for it! I’m really seriously hoping I can get a video up every day alongside an article on the blog… wish me luck? I’ve thought a lot today about why I stitch. Not for any particular reason, I just tend to get introspective sometimes. Why do I stitch? What enjoyment do I get from a craft that forces me to sit still for several hours, entirely focused on needle and thread, counting and making small ‘x’s on fabric to form a picture? The answer to this is different for everyone. For me in particular, it comes with a story. I’ve cross-stitched since I was eight years old, but during the teenager years I didn’t do a lot of stitching. I had better things to do with my time like play video games or surf the Internet. Typical teenager stuff. And when I was 16, I hit a rough patch like a typical teenager does. Except mine was anything but typical. It was a chemical imbalance that caused a whole host of problems: I was under high levels of stress and unable to manage it effectively, I was constantly ill with one thing after another, and I sank into a depression that lasted more than a year. I ended up seeing a doctor for one of my problems and the medication they gave me helped right the chemical imbalance and the rest went away on their own, with a few relapses every now and again. But for that year, it felt as if my world crumbled around me and I lost passion for every single hobby I participated in up to that point. I no longer enjoyed anything. I didn’t feel as if I liked anything I use to like. I had nothing to turn to as a pick-me-up or a distraction. I dropped all my hobbies and activities. When I came out on the other side of the depression wall a year later I was at square zero with nothing to keep myself occupied. Stitching has always been an activity at the back of my mind. Something I always thought about but rarely did. Since I had nothing else to do, I dug out my stitching stuff and went through it to see what I had left from when I was a kid. I didn’t have much, but I did have a few mini-kits. And I picked up the needle again. When someone asks me why I stitch, I tell them it’s a stress reliever. That’s true for a lot of people. When you make any sort of craft – and I feel this is especially true for cross-stitch – you fall into a mindless rhythm. If I’ve got my count down and I’m in a block of color my fingers move on their own. But when I’m counting or I’ve got to watch my stitches, it’s the only thing I can focus on – it physically prevents me from other thoughts. I’m a dweller, a worrier; I have mild anxiety where a thought or action can leave my stomach in knots for hours. But when I stitch, I don’t overthink about things. I can’t. I’ll mess up my count. When someone asks me why I stitch, I tell them it’s an art where you don’t have to be an artist. I definitely have mastery over the keyboard more than the pen. I can’t draw a straight line. I barely color within the lines, and I never liked to use paint. I can’t dance, I can’t create professional music. When I see beautiful works of art I feel envious: I wish I could do what they do. And yet, cross-stitch is one of the oldest forms of needlework on the planet. Cave people sewed ‘x’s into cloth while others painted the cave walls. I create a work of art made of needle and thread with every up and down motion of the needle, with every ‘x’ I make. I don’t have to have a steady hand or a keen eye or a healthy body. I just need patience, fabric, a needle, and thread. When someone asks me why I stitch, I tell them I can create a work of art that will last for centuries. It may never hang in a museum like a Da Vinci or a Picasso, but if time and luck and fate permits it will hang on someone’s wall long after I’m gone. I don’t expect my piece of a cutesy butterfly to go down in history but it’s already been proven cross-stitch is an artwork that stands the test of time. Women and men have practiced the art since before we had words to write about it, and I am proud to say I can carry on that tradition. It may seem unpopular or unknown, but the art of cross-stitch and other needlework will never die out. When someone asks me why I stitch, I tell them it’s because a needle and thread doesn’t care you who are. The stitching community doesn’t care who you are. Man, woman, young, old, thin, fat, healthy, sick, formally educated or self-taught… the people are as diverse as the craft. We all have different tastes and there is a piece that will suit you. I am a young, twenty-something woman with a myriad of health issues and no formal secondary education. The needle doesn’t care. Cross-stitch and the community built around it is so remarkably accepting in a world that divides itself over pretty much everything. Anyone can learn the craft or pick up a needle. It doesn’t matter who you are. Stitching certainly isn’t for everyone; nothing is. But I personally have fallen head over heels in love with all of it. It became my pick-me-up, my distraction from reality. I have pushed myself above and beyond what I expected when I made my first stitch after so many years. The power of creation is in my grasp. I want to share this joy with everyone! And if I’ve encouraged even just one other person to start stitching again, or enticed someone to look into starting… then that’s a victory for me. This is why I stitch. Why do you? My kitten and I working on my latest project. As those of you who have followed my blog for any length of time know, even before this blog was created, I had a problem with my left wrist. I have to wear a brace for it and it limits the use of my left hand. After two years, four different braces, and five doctors, they still aren’t sure what’s causing the problem. The only suggestion I have received is one of two things: a ganglion cyst, or a tear in a ligament. Or it could be both. Or neither! All scans have been inconclusive. All I know is, it hurts. A lot. Their solution to the problem has been cortisone steroid injections and digging around with needles to see if they can get the cyst (if there is one) or heal up any injury there may be. I had my first procedure the middle of June; it didn’t help at all. But I also worked two jobs over 60 hours a week, and I only had three days off to rest it. So I figured, I just didn’t give it enough time to heal. It’ll get better once life calms down. Since then, I left my second job, went on vacation, and had my second procedure. All good. My wrist was sore from the needles and the steroid, but it felt better. My first job at Joann’s was kind enough not to put me on the schedule until I asked them to. I had five days of rest before I went in to work today for my first 8 hour shift in about three weeks. I was on shift working the cutting counter for four hours. Still had four to go. And my wrist was killing me. Four hours of work reversed five days of healing. It was as if I had never gotten the injection at all. As this is how it’s been for the past few years… I believe the work I currently do (retail) aggravates whatever problem my wrist has. I need an easy job where I can take frequent breaks, as to not strain my wrist. As this is unrealistic in the working world I currently inhabit, I should turn towards working from home. Let’s examine my skills that I could turn into a business from home and/or market to get a job where I can work from home. I can type. I can blog. (So, put together, I can write.) And I can stitch. Okay, good. 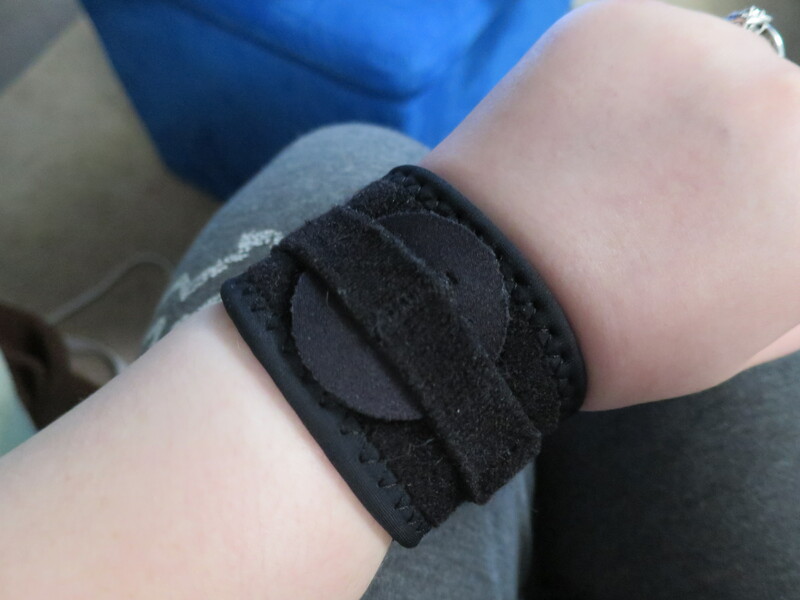 Now these things do actually irritate my wrist, but if I work at my own pace and can take breaks whenever I want, it shouldn’t be that big of a problem. Here is the issue: these things aren’t exactly the most accessible to make money through. At least on the blog front. I don’t average enough viewers to make money, as much as I love it and as much as I would like to. So let’s look at stitching. Now I’m not an artist, and I understand copyright – so designing and distributing charts is out. I don’t know how to make my own fabric or threads, so supplies are out. (Not that I can’t learn, of course, but as it stands I don’t know how so it won’t count.) I could probably make little accessories like needle minders and scissor fobs and whatnot, if I had an artistic talent, which I don’t, really, or else I’d design my own charts! So what does that leave on the stitching front? Custom framing? I could probably learn how to do that. I could learn how to make my own fabrics and threads, possibly. Little accessories are a possibility also. I DO know there’s such a thing as model stitching – you know, the finished pieces that are used to show what the chart will look like. Usually used to help sell the piece, as on a kit or a booklet. Someone’s gotta stitch those, right? That would be a great job! But I don’t know how to get started. I do pieces from kits, I don’t have a favorite designer… if model stitching was my job I’m sure I would stitch a LOT more and get done faster, but as it stands I’m slow and my favorite pieces are small. How does one break into the model stitching industry? Anybody have any ideas? While I’m on the subject of asking questions, what would YOU suggest for a stitching-oriented, from-home job? I’ve also considered possibly teaching, as I know the DMC mentor program is a thing. Or maybe software development? An app/website that keeps track of your WIPs, your threads, your whatever? Something by a stitcher for fellow stitchers? I don’t know. I’ve just been feeling down because I didn’t use my left hand for five days, felt better, and immediately after going back to a job I love my wrist felt all the way back to square one. Anyway. Let me know your thoughts! Send those ideas my way! And if you happen to be someone or know someone who can talk to me about model stitching and how to get into it, I’d love to chat!